The inspirational true story of a Jewish girl and her family hiding from the Nazis in a secret annex in Amsterdam. Innovative staging brings new life to this timeless drama of courage, compassion and the indomitable human spirit. The Diary of Anne Frank is considered it suitable for most ages, though its ending may be too harrowing for some younger children. This production has some mature content. Smoking is depicted with e-cigarettes. Joseph Ziegler as Mr. Frank and Sara Farb as Anne Frank in The Diary of Anne Frank. Photography by David Hou. 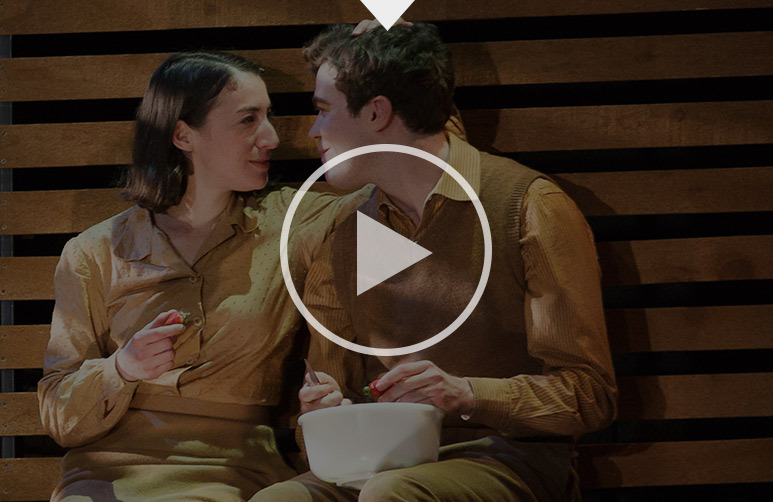 From left: Shannon Taylor as Margot Frank, Sara Farb as Anne Frank and André Morin as Peter van Daan in The Diary of Anne Frank. Photography by David Hou. Sara Farb as Anne Frank in The Diary of Anne Frank. Photography by David Hou. Members of the company in The Diary of Anne Frank. Photography by David Hou. Joseph Ziegler as Mr. Frank in The Diary of Anne Frank. Photography by David Hou. Sara Farb (left) as Anne Frank and Shannon Taylor as Margot Frank in The Diary of Anne Frank. Photography by David Hou. Lucy Peacock (left) as Mrs. Frank and Shannon Taylor as Margot Frank in The Diary of Anne Frank. Photography by David Hou. Yanna McIntosh as Mrs. van Daan and Christopher Morris as Mr. Dussel in The Diary of Anne Frank. Photography by David Hou. If you would like to receive an accessible version of one of our PDF documents, please send us an email request and tell us which document(s) you need.